As a chiropractor, you are likely competing with multiple other practices in your area. Because of that, you need to make sure your website is setup and optimized correctly. While these are just a starting point for building your practice and getting found online, they are absolutely imperative to have done correctly for long-term rankings success. You want the Title and Description of each page on your website to be unique. On top of that, you want to make sure the information you are telling search engines is being best utilized. This doesn’t serve much purpose from an optimization perspective. While it does have the name of the doctor, Dr. Jones, it doesn’t provide any additional support information for search engines… OR patients! This title is optimized for the location of the practice and includes additional supporting information about the services provided. Use keywords in your URLs while making them readable and avoid spamming. Shorter URLs are generally preferred and look cleaner. This URL is incredibly long and suggests you would also have a similar URL structure for each of the other pages on your site. That means you would be creating additional pages, all optimized similarly, for your other ailments like “back pain”, “neck pain”, “shoulder pain”, “wrist pain”, etc. This is much cleaner and you can utilize the other optimization elements like Title, Description, and Content to build location relevancy on the page. This also allows for cleaner growth as content is developed for the other ailments you treat. When publishing content about your practice, services, or ailments, be sure to include synonyms or other words patients may be typing in for help with their aches and pains. For example, if you’re explaining how you can help with “neck pain”, you may want to also include information about “text neck”, “neck tightness”, “stiff neck”, and other associated or closely related descriptors patients may use when seeking help. Use descriptive keywords/phrases about images you include within your content. Remember, make it descriptive and readable and avoid spamming. On your “neck pain” page, it would make sense to have an image of somebody grabbing their neck and wincing in pain. In that case, you would want to make sure the image is named and tagged appropriately. On the flip side, you could include an image of a patient receiving a neck adjustment. Again, make sure the file is named and tagged accordingly. Use helpful keywords when linking to internal and external content. Use your content as a resource for your readers to find information they seek. 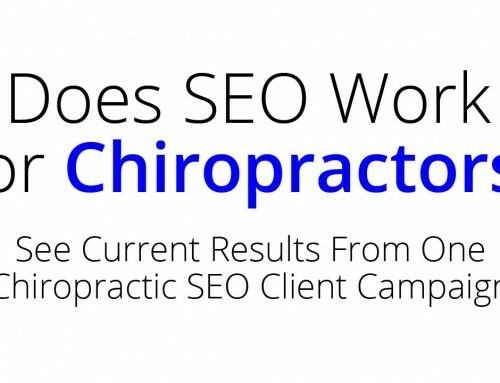 Read this article for more information on how beneficial SEO can be for chiropractors. If you are writing content about “spinal decompression” and mention how various stretches can impact and benefit patients, add a link to the appropriate page on your site describing the additional information for patients. Additionally, if the ACA released new information about headaches and chiropractic, you can direct your patients to that as a resource for them (just like that). 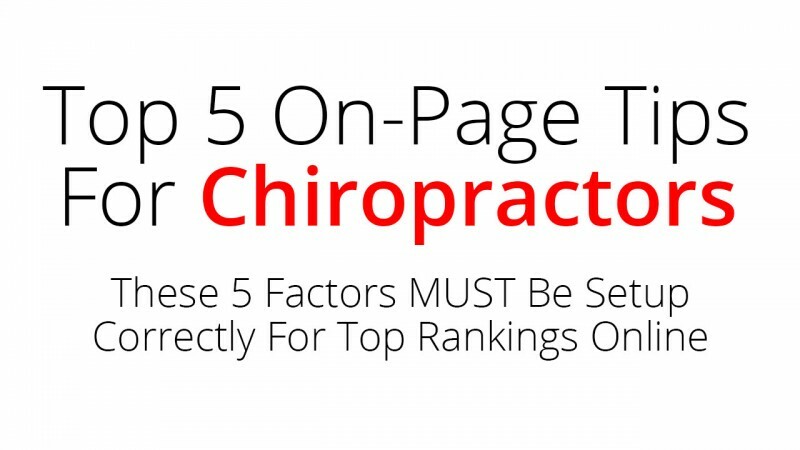 Hopefully these 5 tips help with your chiropractic optimization. Remember, these are just the starting point. In most markets, and especially competitive areas, you will need to do more than just have your content optimized to show up at the top of search engines for your most competitive keywords and phrases. If you’d like to learn more, we can send you a free detailed video analysis of your site to help outline what’s going on in your market and explain what your top competitors are doing to rank at the top – and how you can start getting more patients from your website rankings as well.